2019 Update: This is one of those old posts that still gets comments from people who don’t know how websites work. When you’re the third smallest state in the US and you still manage to cram in so many hundreds of museums, it stands to reason that a good percentage of them will be tiny. I’ve seen my share – and can’t determine which is the smallest, but the Button Museum is in the running. An interesting thing about this one is that it is a museum within a museum. Yes, tucked away on the third floor of the wonderful Mattatuck Museum, this one room full of nothing but buttons – and I mean nothing but buttons – is THE place to go to fulfill all your button viewing needs. 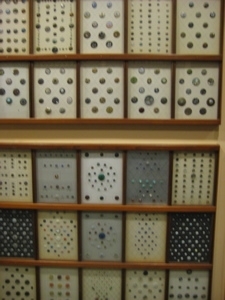 The Waterbury Button Museum is a permanent exhibit with over 10,000 exquisite buttons, assembled by Warren F. Kaynor for the Waterbury Button Company over 60 years ago. 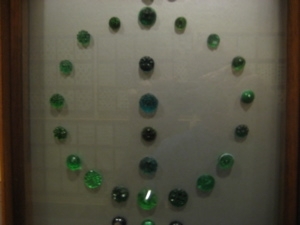 It includes buttons from all over the world, with many 18th and 19th century examples – buttons worn by George Washington, buttons on display at the 1878 Paris Exposition, picture buttons, buttons made of Czechoslovakian glass, Japanese enamel, ivory, wood, china, pearls, jewels, and many, many more. That last paragraph was courtesy of the Mattatuck website. And thank goodness for that because as much as I know about and love me some buttons, the museum lacks explanatory signage. So I merely found myself looking at lots of buttons. Lots and lots of buttons. My story would end there, but fortunately for us all, the Old Gray Lady can bail me out. Back in 2001, the grand opening of the Button Museum warranted a nice little story in the New York Times, which I will liberally borrow from to fill out my story. First of all, their title, “More Than a Sewing Fancy” is pretty weak. But I’ll forgive the author because she did some fine research on the collection. 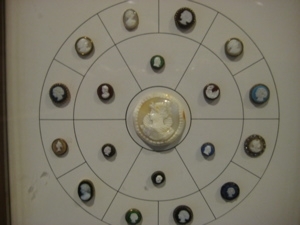 “When the Waterbury Companies decided to sell the Waterbury Button Company, one of the assets that was kept was the button museum,” said Carl Contadini, president of Waterbury Companies Inc.
Rachael E. Guest, an assistant curator of the Mattatuck Museum, said the company considered breaking up the collection and selling it. 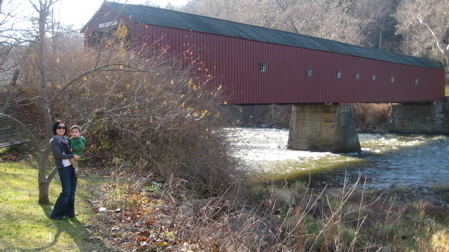 “But instead they decided the right thing to do was to keep it intact because it is an important part of Waterbury’s history,” she said. I’m just going to copy and paste the rest of the article, because really, I haven’t anything more to say about the collection than the article does. I apologize for my laziness. The manufacture of buttons, first by hand and then by machine, has been a mainstay of the region’s economy since the late 18th century. That story is documented in a community history exhibition on the museum’s first floor where several button-making machines are displayed along with pictures, including one of an eagle, fashioned from buttons. 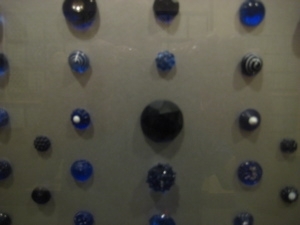 The Button Museum was originally assembled more than 50 years ago by the man who was then president of the Waterbury Button Company, Warren F. Kaynor. 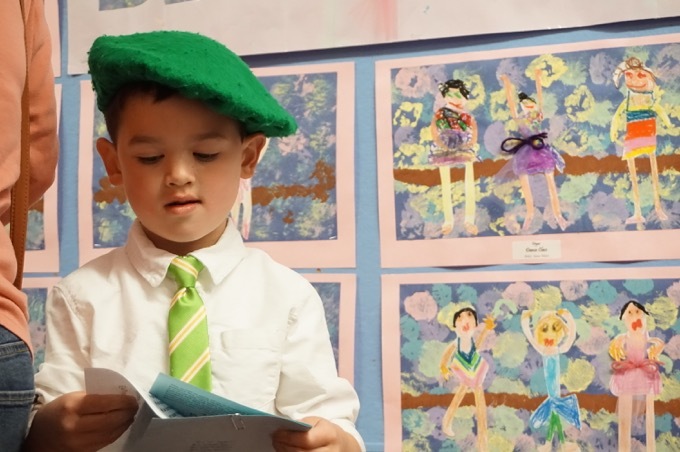 It was created with buttons rich not only in the history of Waterbury and Connecticut but of the world. At the Mattatuck Museum 10,000 buttons are on display, and that’s not the entire collection. 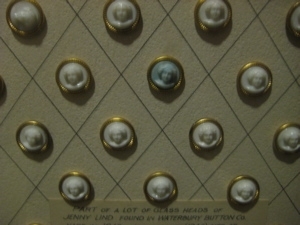 Researchers can make use of of binders of samples of every button made by the Waterbury Button Company. 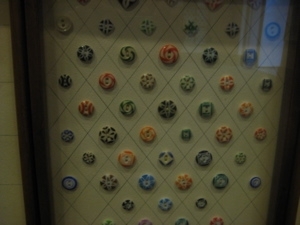 The buttons are considered to be miniature works of art, reflecting changing artistic influences. Made in a variety of materials — glass, porcelain, pearl, metal, bone, wood and jade — they are decorated with motifs that include images of military heroes, feats of engineering and storybook characters. One brass button shows Little Red Riding Hood with a rather docile-looking wolf sitting next to her. The exhibit includes four engraved bronze buttons, taken from General George Washington’s coat. The buttons had been removed and divided among his descendants (remaining in the Washington family until 1930). They are now mounted on a morocco case. 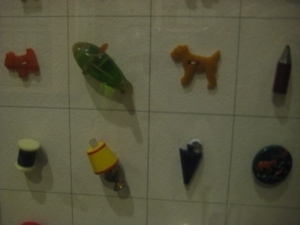 Other eye stoppers include carved cinnabar from Asia, Japanese netsuke and colorful Bakelite buttons from the 1930’s, lighthearted symbols of a sail boat, Scottie, ear of corn or a penguin. There are floral bouquets made of human hair placed under glass, military buttons, black glass and marquisette buttons popularized by Queen Victoria and a case of tiny Jenny Lind portrait buttons. Habitat buttons made in France preserve plant or insects under glass, ”some referred to as paperweight buttons because they are made the same way,” Ms. Guest said. Since I was alone up on the Button Museum, I didn’t quite see all the wonders that this article says are there. And with the lack of signs, I had no idea what I was looking at most of the time. Oh well. I went back downstairs and took another walk through the art galleries (second floor) and the historical exhibits on the first floor. The little Button Museum is but the cherry on top of one of Connecticut’s finest museums. Last year, at age 70, I made a ‘hat of buttons’ in a Community College art sculpture class by sewing many buttons to a lace hembinding. The buttons were collected over the years by me, and some belonged to my grandmother. Is your museum display only those collected by you and your staff? This blog is not associated with the Button museum at all. All I did was visit it. You’ll need to contact them, but I believe this was all one man’s collection as the article states. Can you tell me something about german or european influence on the production of military buttons in Waterbury between 1830 and 1900? I have a Waterbury Button I am trying to ID. I is a Virignia State Seal button. It is 2 piece, and is made of silver. Can you direct me to any reference material? I have a custom made civil war 28 mm engineer button I dug and is a very nice button with RMDC Has the letter E on face like the small confederate buttons.I talked to my friend and some who are deals and they love the button but we can’t fine it anywhere in the civil war books because its a very rare custom made 2 piece button with ” Scovill Waterbury MF’g Co on back!I talked to one dealer William Liegh here and Va and he said it was a very nice rare custom made confederate button. These are very rare and are a 10 in rarity.Can any one help on getting more info on here.It was dug in a confederate campsite on Lee’s retreat route to Saylors Creek Va. last fall.It has some gold gilt and a smooth oval shape dome with a nice rim. Call me @ [redacted phone number] and ask for Me Steve Maybe you can help. What is it about this page that attracts so many same-minded web surfers who refuse to read more than a few words on this page? I was nice to Nancy in the comments above, but Dr. Trox, JohnReynolds and Steve… I can’t be so nice. “I am not an appraiser, museum owner, museum volunteer, museum professional, antique salesman, antique buyer or anything like that. I’m a blogger. I write ABOUT museums, I DO NOT work in one. I wish you all the luck in the world and hope your buttons are worth millions. Will Now, If you would have stated this in the first place,people would not have to tell you to do so. I guess I am the only one with such a very nice Engineer button.Thats not in a museum. I don’t really understand the above comment, other than the “don’t reply” part which I’m clearly disobeying. First, because “Steve” the commenter is safely anonymous, despite his posting his telephone number previously which I have deleted. So I thought it was pretty funny that he then went to this page and commented again. Looks like its pretty funny.No you not a total jeck.What is it about this page that attracts so many same-minded web surfers who refuse to read more than a few words on this page? I was nice to Nancy in the comments above, but Dr. Trox, JohnReynolds and Steve… I can’t be so nice. And your right steve they are…. parents who probably acquired it around 1912. It would be interesting to create one with 2012 coming up. Do you have one like it in the museum? I would like to find a non-profit to gift my Waterbury Button Co. Ivory Nut paperweight. 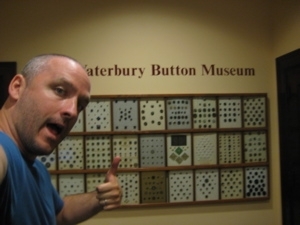 Thank you for the write up about the Waterbury Button museum within a museum. The button quester follow up comments are hilarious, sorry it had to be at your expense. It makes me so happy I decided not to join any of the “button societies” even though I have 80,000 buttons. I’ll just sew them on clothes and enjoy them in peace. LOL And maybe visit that museum someday, although I probably have a good portion of what they do! “I cannot appraise anything other than your lack of reading comprehension.” Sorry, I’m still giggling! 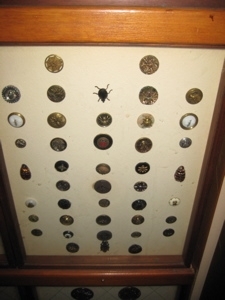 So, I have this button collection that I inherited from my Aunt Ida, and they look really cool and all but I need so cash. Can you help me sell them to the museum, I am sure that they don’t have anything like what I have in their collection. Just Kidding….I could not resist. I don’t know what I enjoyed more your write up or the comments. I can haz buttonz? I like buttonz. Plz hlp me 2 get to the place the buttonz. Thanks for the reminder about the comments here – I needed a good laugh today! Been a while being here,Will now O got some great news! I went relic hunting and dug 2 26mm large confederate engineer buttons the sunday before Thanksgiven. Look in the Albert book button 152. Now that nobody ever new what the other button I dug that was a waterbury button with a manuscripte button just about like the ones in the confederate book Alberts. Now I no for sure what I have dug with no beating around the bush!Since I found out the first button I dug way back when and wrote here I found out the the waterbury button was a make shift button the confederate used for a replacement late in the war.I had my heart on that button being a super nice button.But now just last sunday 11/20/1011 the lord bless me with 2 confederate buttons. That the guy who repled to my comments can have a real nice laugh now. I,am not laughing but smiling BIG!!!!! Thats cool steve, Them buttons are worth about $4500.00 a piece on up and thats in fair condition. Nice Blog, I’ll be featuring it on our Facebook page if you don’t have any objections. It’s all about the Buttons! If you want information on your Buttons or feel the need to post a pic of that rare Civil war Button, stop by our Facebook page and stop bothering Steve…lol! Did you see the bug in the picture on the light colored buttons in the “Just Some Buttons”? Looks like a lovely sink bug button to me. UGH. On http://www.buttonphotobook@wordpress.com I show a new book on buttons made of a designer in Denmark. It has not been printes yet, because we are still looking for a publisher, who is interested, or a foundation, who can support the publishing. Do you know a publisher in USA, who would be interested, or someone who would support publishing of a book like that. I found a solid brass button while metal detecting maine. eagle perched on crooked anchor w/ 13 stars. waterbury button co. on the back. Looks like navy!!! I can’t find it anywhere on the web.. any imput helps!!!! I have a button that on the front is a roman soldier carved out of gold and some sort of resin or glaze over the top and it has 4 pegs that come on the sides as if to wrap string around and a loop on the back is there anyone who can tell me about it .get back with me and Ill send a picture please contact me by e-mail at pamelamcginnis46@att.net thank you. Hello.i have acquired thousands of antique buttons and need to sell the whole lot!Please advise as to how I can do this. I have a “waterbury co’s conn” on it, it’s brass with 13 stars not connected in a circle and the eagle perched facing left. Ran across this post while searching for Button Museums to visit in New England. Helpful piece. Even better comments section. Is there a blog that features stoopid and annoying blog comments? Because I think you have a winner here.